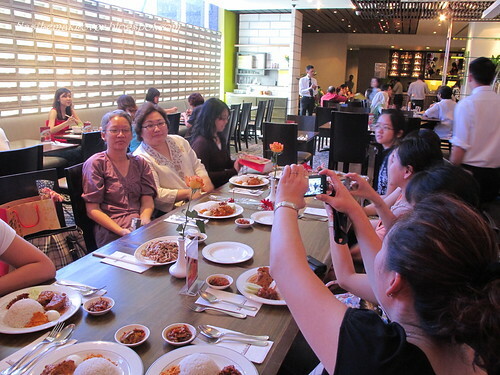 Even this was not my 1st time meeting bloggers, but I still feel so excited yesterday. 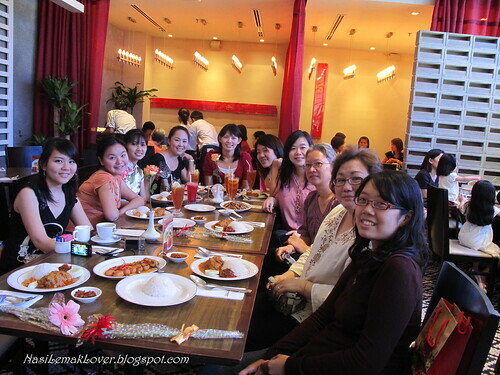 We had our meet up yesterday at Mid Valley KL, and I'm so happy to know 9 new friends in only one day. Who say blogging is not good! 4. 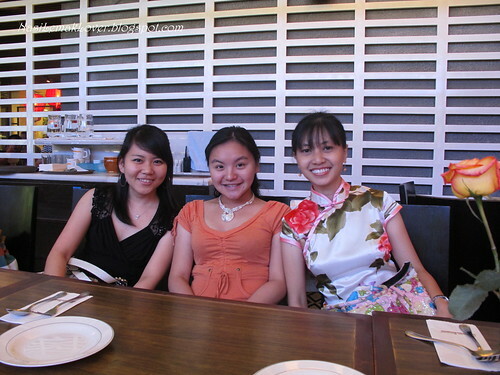 ReeseKitchen (Reese)- Need more tips from her about Taipei trip later. 5. 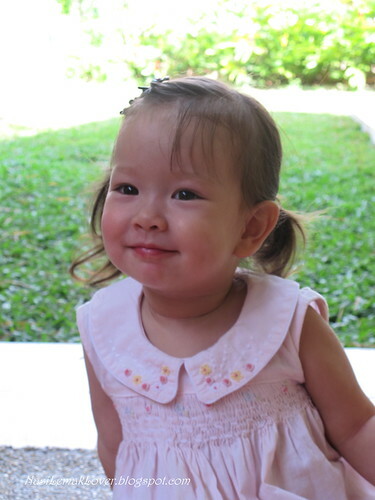 Honey Bee Sweet (BeeBee)- all the way from Singapore ! 6. 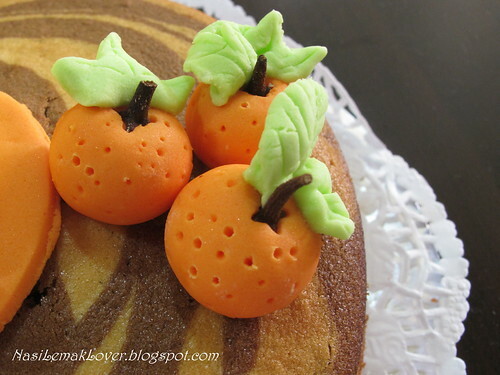 The Sweet Spot (Swee San) she makes lovely fondant cakes, do order from her ! 7. 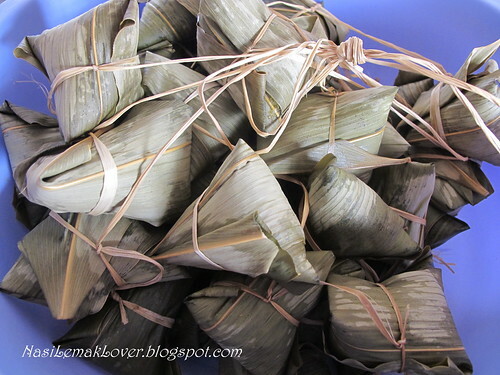 Is me (Sonia)- Nasi Lemak Lover ! 8. 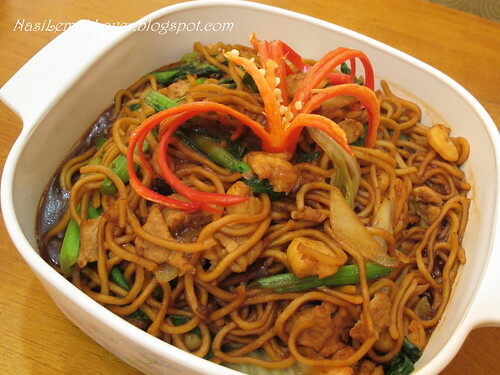 Elinluv's Tidbits corner (Elin)- all the way from Ipoh ! 10. Dodol & Mochi (Pei Lin)- Thanks for sharing some camera shoting tips. 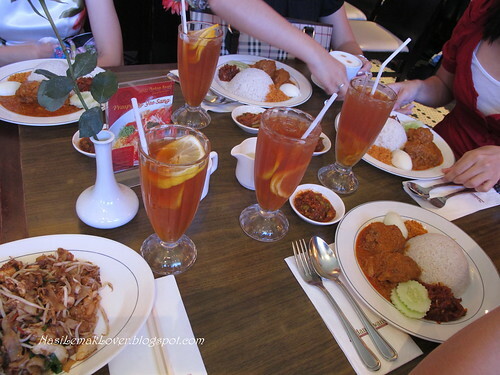 - This gathering turned out like a Nasi Lemak gathering, because 8 bloggers ordered Nasi Lemak, but me as Nasi Lemak Lover ordered Fried Kuey Teow instead, hehehe.. Thank you, Quinn, Reese, Elin, Tracie, Swee San, Gertrude, Pei Lin, Bee Bee and Petite Nyonya, for your time and wonderful company, and I can't wait till the next time we meet again! p/s Thanks Petite Nyonya for the lovely flower and egg mould from Elin ! Check Reese's update for this meeting . My mom's homemade kuih-muih for "Pai Tin Kong"
These are kuih-muih (cakes) that prepared by my mom during "Pai Tin Kong" celebration. 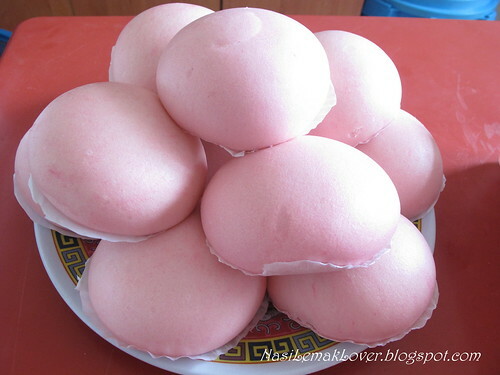 -Steamed pau shape like tortoise..
- We love this " Ang Ku Ker", not too sweet, no artificial colouring added(the skin is made from sweet potato), will learn this from my mom, and share later with your. 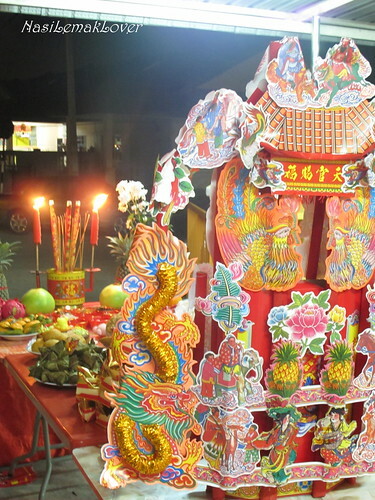 -This "Huat Ker" is very "Huat" !! 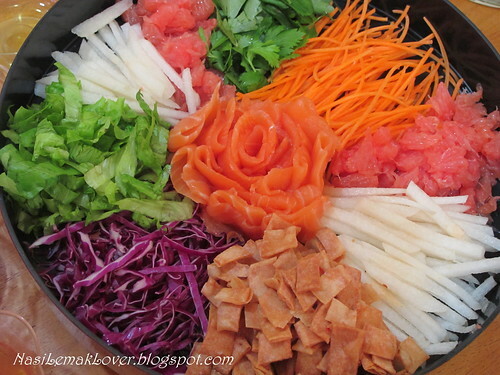 Here is the recipe for my own style of "Yee Sang". I did not record down the actual weight, I just agak-agak (estimate) only, thus you pandai pandai agak lar (adjust accordingly)!! For the cripsy chips, at first I followed a recipe published in a newspaper, but the chisp was not cripsy but chewy instead,and turned hard when cooled. 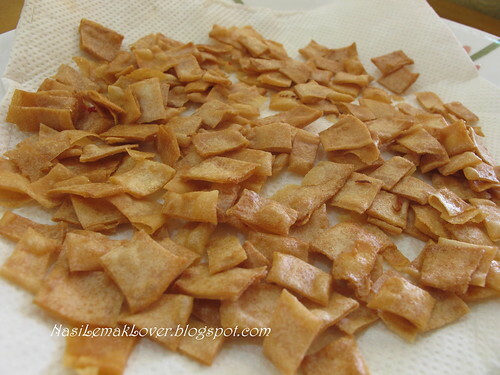 No choice, I created with my own crispy red fermented bean curd chips recipe. 1. 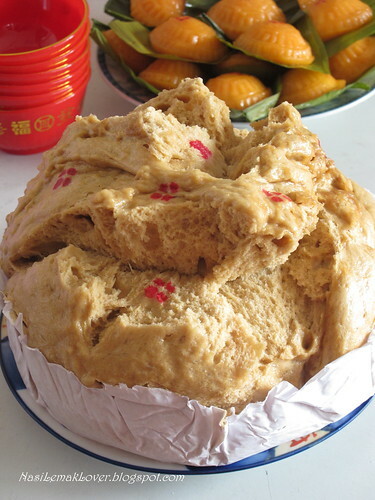 Well combine the egg, red fermented bean curd and add a pinch of salt. 2. Spread the mixture on the spring roll skin. 3. 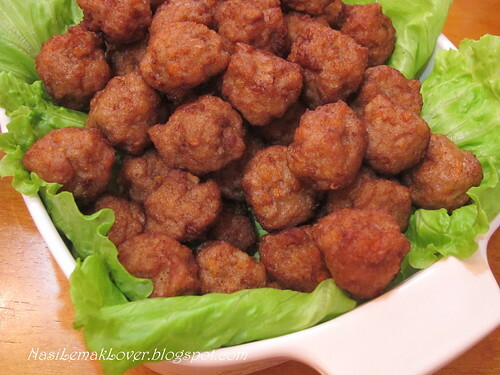 Fold and cut into small strips, deep fry till golden brown. 4. Store in air-tight container before use. 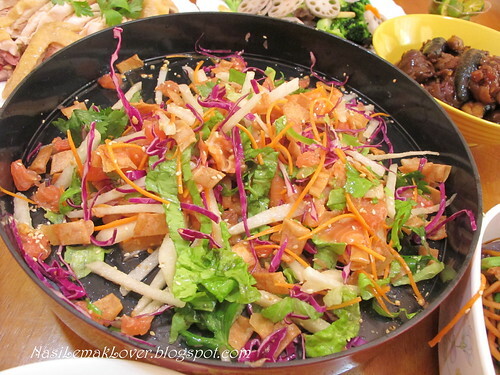 How to eat Yee Sang:-All dinners at the table than stand up and on cue, proceed to toss the shredded ingredients into the air with chopsticks while saying various "auspicious wishes" out loud. It is believed that the height of the toss reflects the height of the dinner's growth in fortunes, thus diners are expected to toss enthusiastically, more details from here. This homemade "Yee Sang" is really good and refreshing, I'm going to make this again and again..
A tiger butter cake specially for "Pai Tin Kong"
-Must have item-sugarcane for "Pai Tin Kong" celebration. 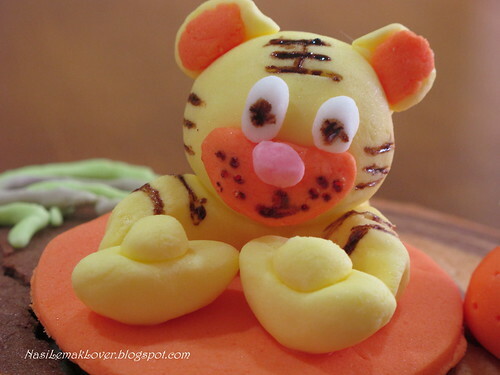 -With my daughter's help, we done a Tiger fondant, and with two "Chin Yuen Pau". 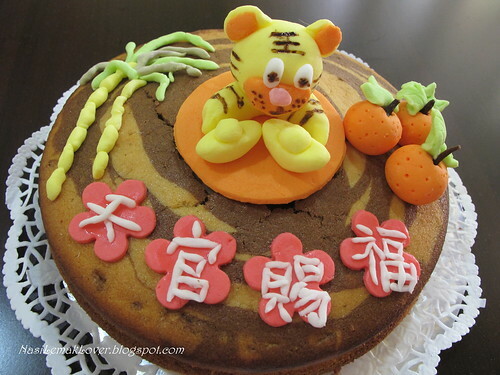 -It just so happens my husband's friend visited us when I was making this cake, so I invited her daughter to take a photo with this Tiger cake. 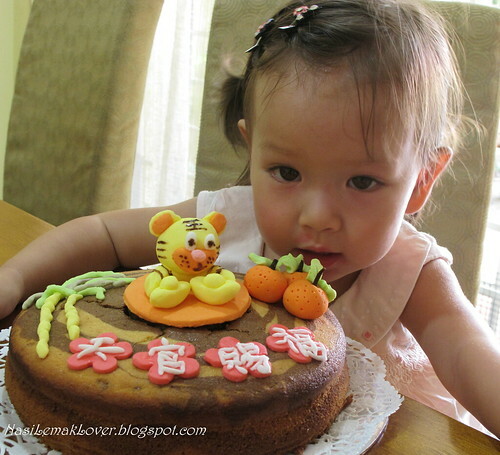 She feel like want to have a bite of this cake, luckily I stopped her, otherwise how to present to "Tin Kong', hehehe..
-My husband keep saying this girl is sweet and cute, then I told his friend why not we book her daughter (mother is Malaysian, father is Aussie) for my two boys, Hahaha.. Thanks everyone for all your CNY well wishes! I had a wonderful time with my family and friends during this festive season, and I supposed you too have a wonderful CNY holidays. 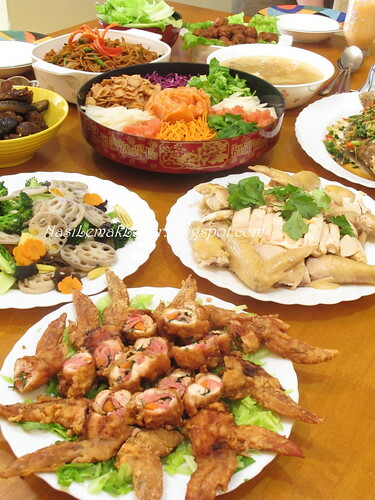 Here are some of the dishes that I prepared for "Reunion dinner", even only with 5 family members, I still followed to traditional way, prepared as many of dishes to fill up my dining table,to show 大魚大肉..
-Here are some of the dishes that I prepared on "Reunion dinner" day, even the name called "Reunion dinner", actually we eat from lunch till dinner, hehehe..
-Hokkian style of noodles-"Hokkian mee"
-Something difference from previous years, this time I prepared " Yee Sang" at home, all ingredients are prepared at home, I even created with my own recipe of "cripy red fermented bean curd (Nam Yue) cookie". This homemade Yee Sang is really good and fresh. 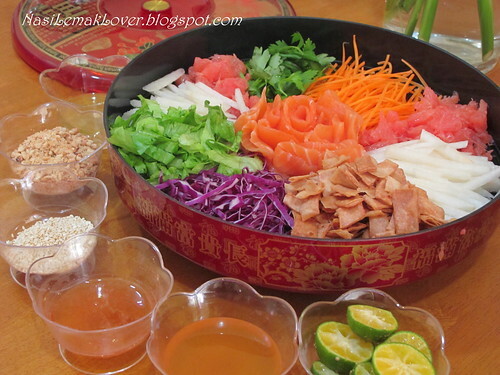 I'm sure homemade "Yee Sang" will be served on every CNY from now onwards..
**Let me know if you wish to learn some of this dish, I will provide recipe later. 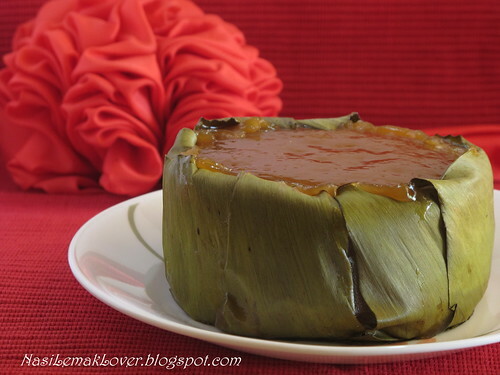 Kuih Bangkit, Happy CNY 新春愉快 ! 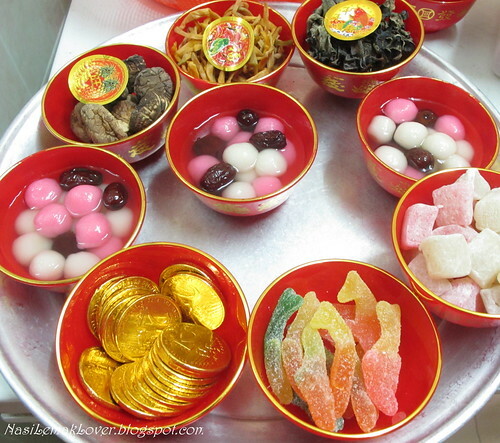 Yeah, 收工了, in order to prepare for the coming Chinese New Year on Sat and last minutes shopping, so this will be my last post, I see your after CNY. 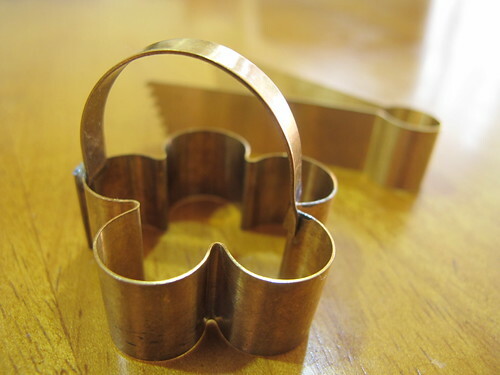 -This was my 3rd batch of Kuih Bangkit (1st batch here,and 2nd batch here), this time I use cookie cutter to cut and use tweezer to pinch patterns, and I realized that shaping by cutter&tweezer are more time consuming than using mould for shaping. 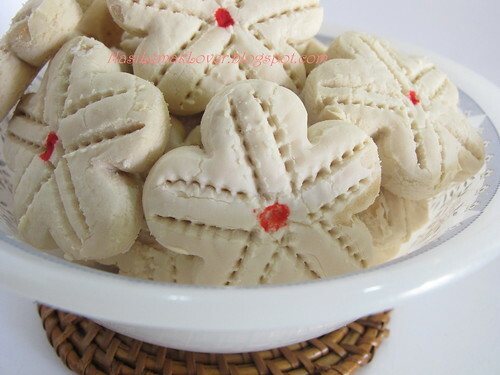 - But I just like this lovely flower shape of Kuih Bangkit ! 7. 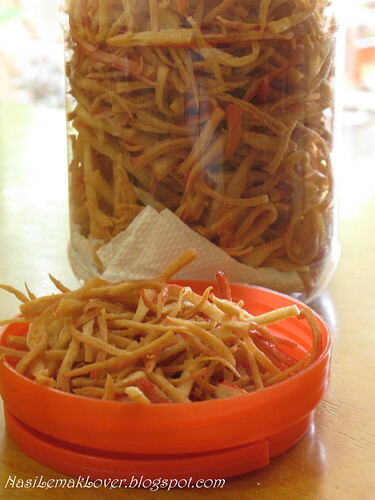 Fried crabstick- shredded crabsticks, deep fry over medium flame, or until golden brown. This fried crabsticks is very crispy and yummy. 8. 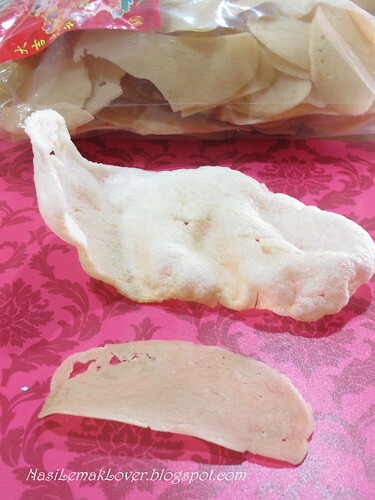 Fried prawan crackers- bought from Kuala Selangor, after fried, became triple in size. 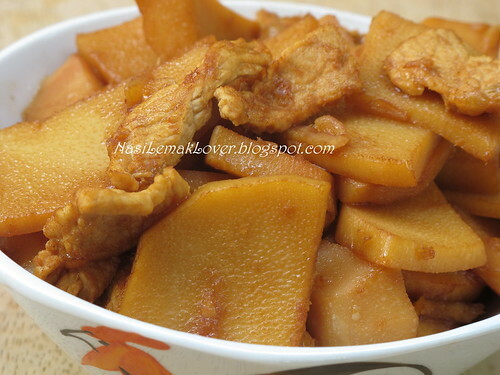 I like this dish-Braised Bamboo shoot pork, but not for my kids, sometime I need to cook something that I like right? 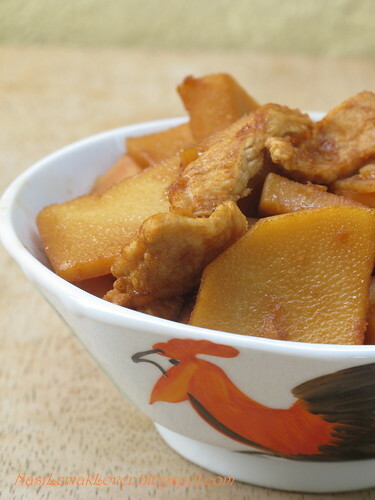 -When cook with bamboo shoot, the important thing is you need to boiled (add little salt) and blanched the bamboo shoot slices at least 2 times (10mins each time), as to remove the bitter taste. -Then just stir fry some chopped garlic and ginger, add in pork slices and bamboo shoot slices, add water and cook for 30-45 mins. Season with salt, light soy sauce and dark soy sauce. 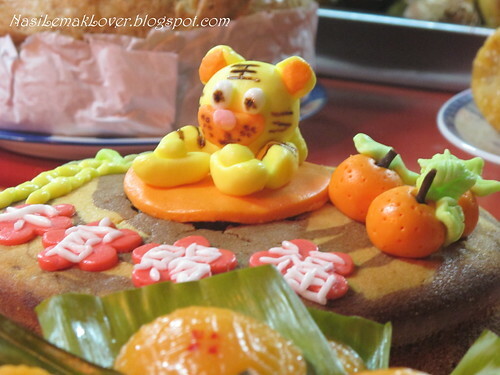 Why Chinese eat Nian Gao during CNY? 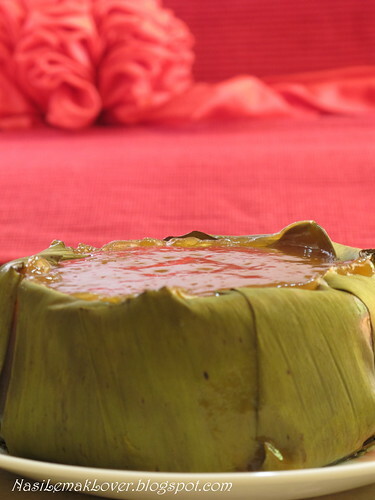 My mum told me that Nian Gao is traditionally fed to the Chinese Kitchen God, so that he will give a favorable report on the family's behavior throughout the previous year when he returns to heaven. A lot of recipes out there required very minimum steaming time(less than an hour), adding brown sugar to make the nice colour. 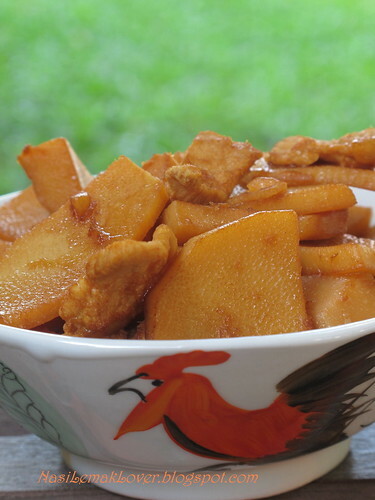 But my mum'recipe will test your patient, because it requires 5 hours steaming time, the process of caramelization makes the Nian Gao with nice brown colour and full of glutinuous rice fragrant. 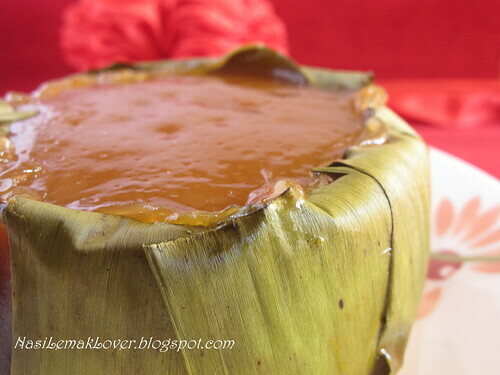 The best part is this Nian Gao can be kept in the fridge up to 6 months even no preservative is added..
steaming bowls- I can't find the right bowl, thus I use empty can from pineapple cans. 1. Line banana leaves on the steaming bowl. 2. 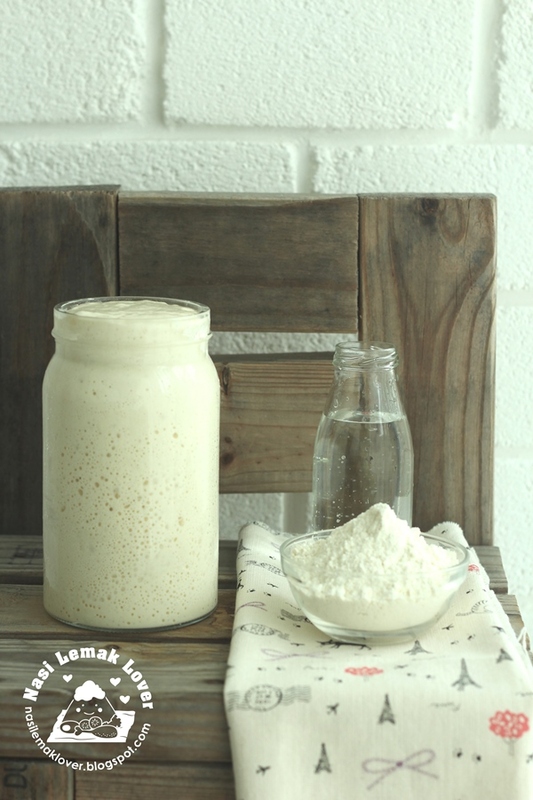 Place the glutinous rice flour in a large bowl, mix in sugar (500g), oil and water. Stir the mixture till sugar dissolved. 3. 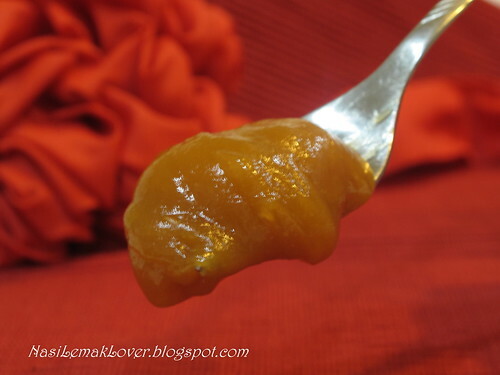 In another pot, cook the balance sugar (100g) till became golden syrup. 5. Strain the mixture and pour the mixture in steaming bowl. 6. 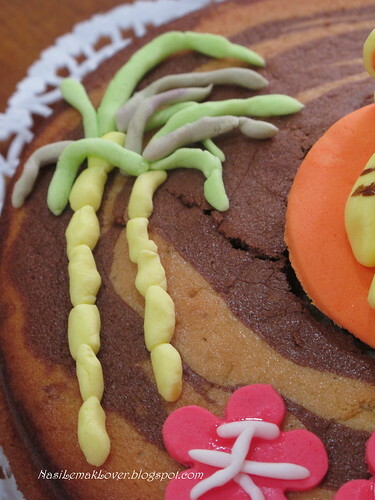 Steam cake over high flame for 1 hour, and turn to low flame for 4 hours. Make sure the water does not dry up, refill hot water from time to time. 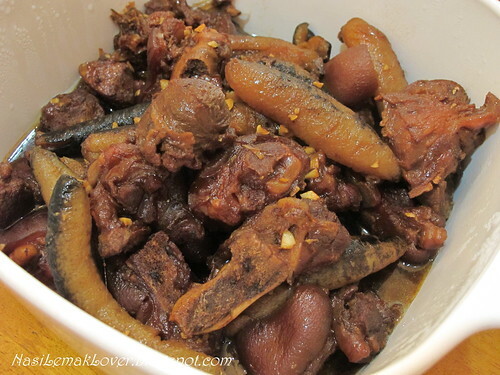 Thanks to Bakeling helping me to translate this recipe in Chinese. 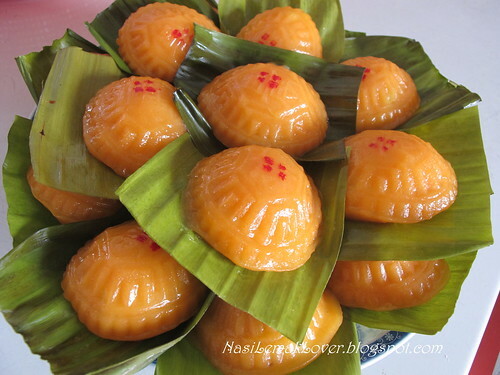 With this lovely bite of Nian Gao, I wish you all "年年高升" (symbolism of raising oneself higher in each coming year ) !! 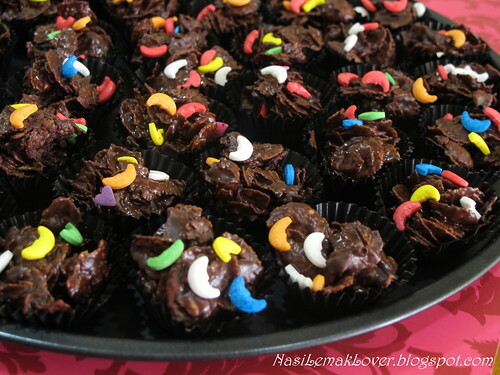 Chocolate Covered Cornflakes cookies 免烘巧克力玉米片, simply easy !! 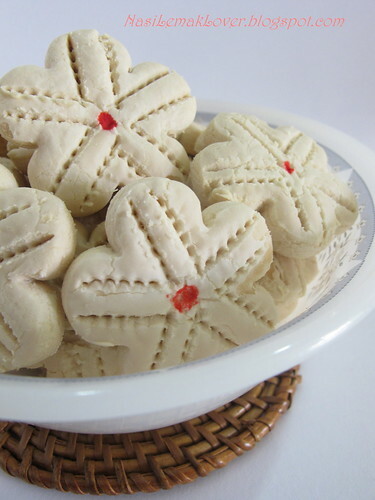 Recipe adapted from Moon's 简单过放屁巧克力玉米, her title really suite to this easy to prepare cookie, hahaha, Thanks Moon !! 1. Melt chocolate over double boiler. 2. 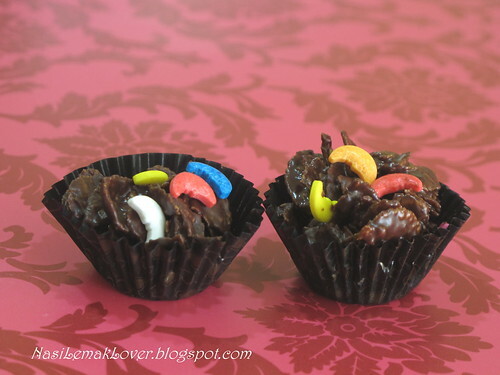 Immediate mix melted chocolate with cornflakes while still hot. 3. Lightly crush the cornflakes while mixing. 4. Spoon into mini paper cups, and decorate it. 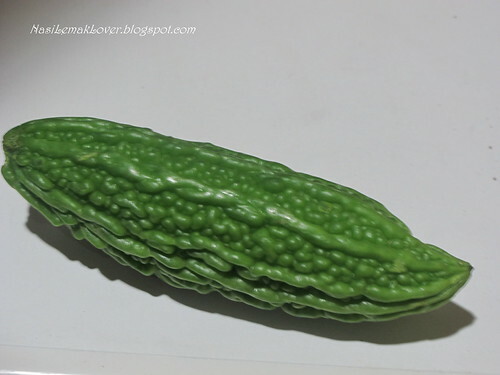 Refer to my earlier dish of Dhal curry, I also cooked Fried chicken Mamak style and fried bittergourd. 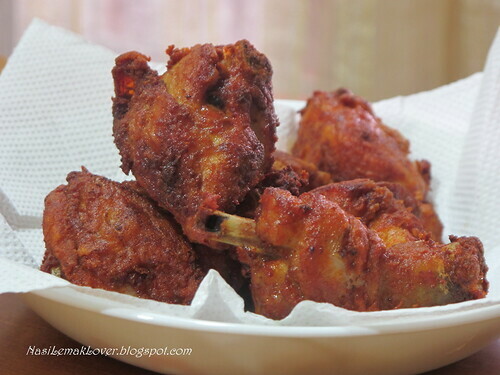 One of the version of fried chicken we like is Mamak style, I came out with my own version after consulted with my Indian friend and Indian worker in the India grocery shop. 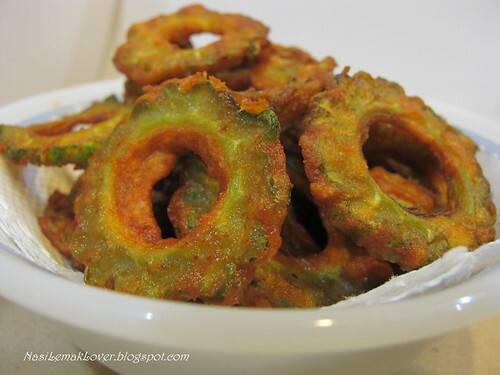 Another Indian style of veggie I like is fried bittergourd. 1. 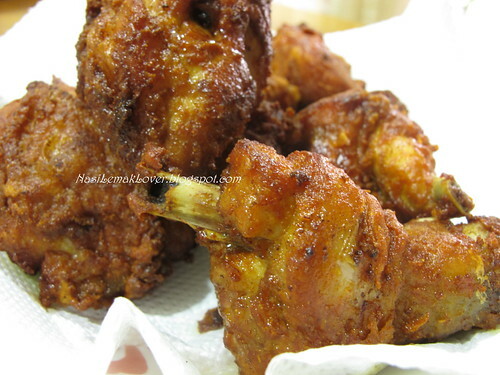 Marinate chicken with above ingredients for 2 hours. 2. 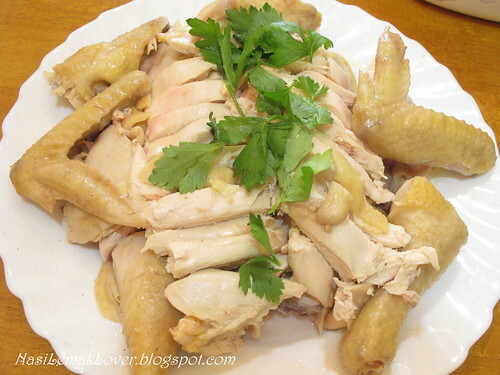 Add rice flour and water to the marinated chicken, mix well. 3. 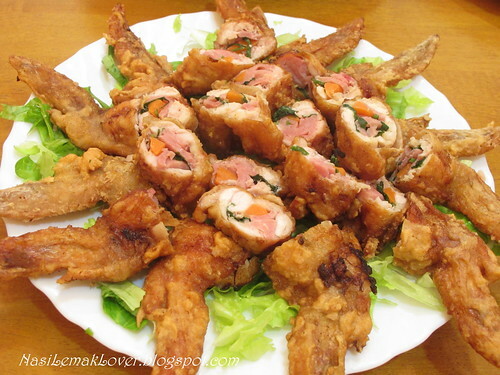 Deep fry chicken on medium heat or until golden brown. 1. 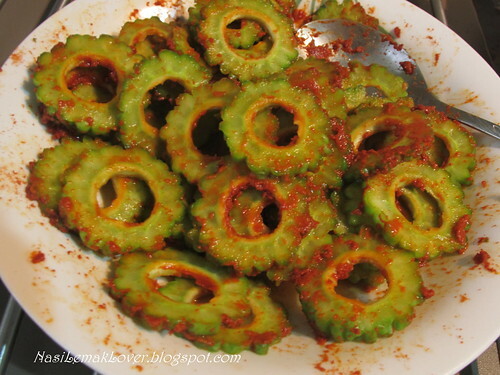 Marinate bittergourd with red chili powder and salt. 2. 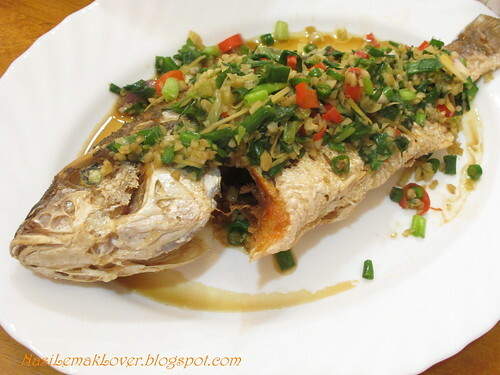 Mix well with rice flour. 3. Deep fry on medium heat. 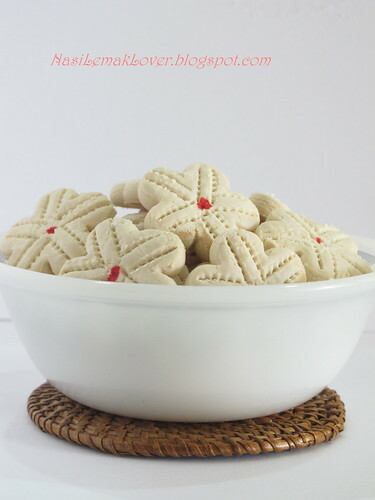 Almond Flakes Cookie 杏仁片饼干, simply crispy !